The Japan Aerospace Exploration Agency (JAXA) has been studying measures to deal with the anomaly detected in one of the ion engines aboard the Asteroid Explorer “HAYABUSA” as reported on November 9, 2009. As a result, the project team has come up with a recovery operation plan, and the project decided to resume the operations, while carefully watching the status of the ion engines. JAXA has been studying the characteristics of the neutralizers and the ion sources. During the study, enough thrust is found available for the rest of the cruise, when the neutralizer of the engine-A is combined with the ion source of the engine-B. While the operation still needs monitored carefully, the project team has concluded the spacecraft can maintain the current return cruise schedule back to the earth around June of 2010, if the new engines configuration continues to work as planned. 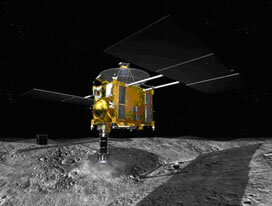 The project team will attentively monitor the return cruise, and JAXA will inform you of any update whenever available. 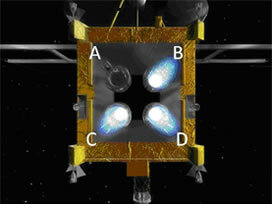 Note) The above image is an artist’s concept to show the three activated ion engines at the same time.